Lopez Island produces abundant grass hay, and pastures grow well between May and November. 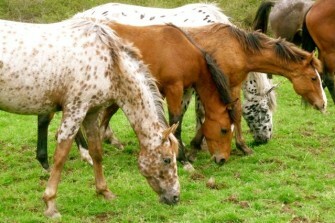 Large pastures afford our horses plenty of exercise, and the chance to socialize naturally as herd members. We believe that a natural environment is a healthy environment. We provide winter shelter, but none of our horses are isolated in stalls or blanketed. We free feed hay, but avoid supplements or grain as long as weight and health are good. Because our soft ground does not allow for adequate natural hoof wear, we trim our horses regularly, but avoid shoes unless use and necessity demand it. Most of our horses perform well barefoot. We feel that a horse’s prospective ability to survive on wild range is an important determiner of its quality and value, and we raise, select for, and encourage durable, healthy, thrifty animals. Our mares are field bred and generally keep their foals by them for eight to ten months. Beside their dams, foals learn to socialize with both humans and horses as part of a herd. After weaning, we often keep youngsters outside our house. This environment exposes them to dogs, cars, farm equipment, surprised visitors, flapping laundry, summer barbecues—and allows young horses to bond with people as part of a human family. We never allow our horses to become pests by spoiling or hand feeding them, but we do encourage them to explore our environment. Many a yearling has ventured into our house when a door was left open! In this way, our horses become confident and friendly. When it comes time to train, they are usually focused, unflappable, and eager to please. By starting this way, our horses are all very easy to catch and handle. And if a fence goes down or a gate is left open, they tend to come visit us, instead of heading down the road! We like to start groundwork at age 2, and hope that each youngster has ponied out along with us on a few rides that year. We often trailer or lead our young horses to the beach, along quiet roads, and through our local hill trails, to expose them to water, traffic, dogs, mailboxes, and wildlife. All our youngsters have trailering experience by then. Although we usually back our two year olds a few times, we like them to mature to age 3, at least, before any real training under saddle. David, who trained our horses until 2009, was a student of natural horsemanship, and his work lives on in a few nice horses. Since then, talented trainer Sus Kellogg has come on board to help give a few of our new youngsters a good start, and Karen hopes to build on her good work. 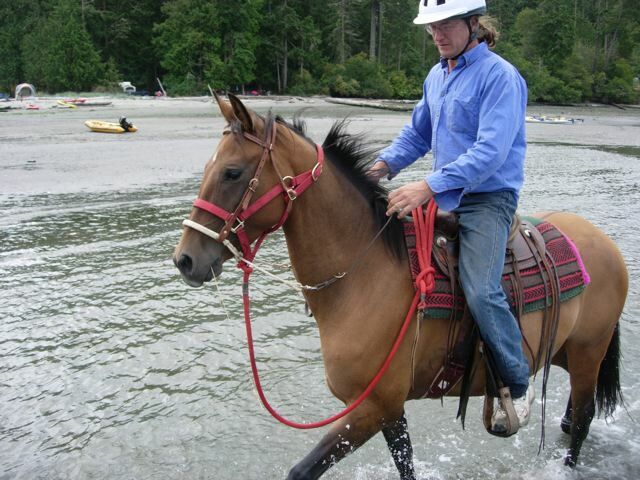 David and Karen always shared the philosophy that trail riding is both the easiest and most advanced form of riding. Easiest because following an experienced horse along a trail is fun for a young horse, and natural. Advanced because a truly good trail horse should be able to do everything demanded of a capable and highly schooled arena horse, but over difficult and unpredictable terrain. As our horses progress, we hope to create steady, straight, collected mounts who are light, courageous, and responsive, no matter where they are asked to go. 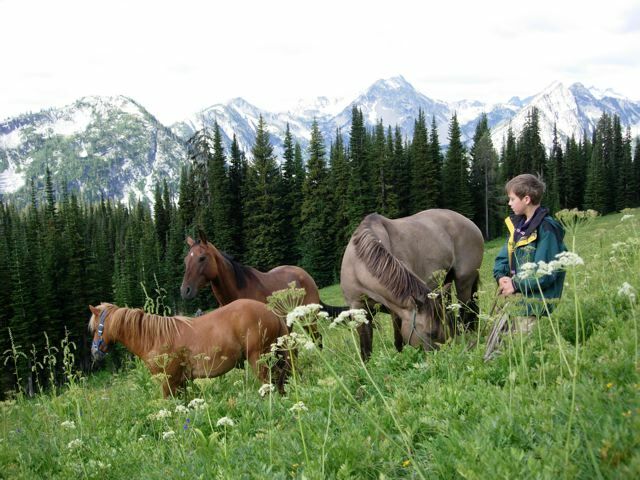 Our horses have always been part of the family, and family adventures are often horse adventures. 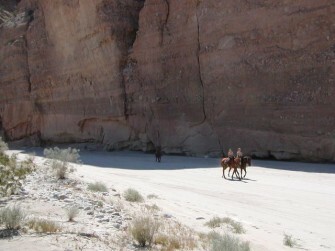 Many of our horses have traveled with us to the deserts and mountains of California and up into the Washington Cascades. While showing horses has its attractions, it’s the wilderness that always calls us, and wins. We’re all winners, there.